My husband and I recently had the pleasure of being guests of the Edgewater Beach Hotel for a wellness weekend. The Edgewater Beach Hotel is a quaint hotel located in Naples Florida directly on the gulf, and only has 125 rooms making it very private. Honestly this was one of the most luxurious trips we had taken in a year! Best part - it was only a 5 minute drive from our house, a relaxing stay-cation, no need to fly anywhere or deal with traffic… just unplug and relax! From the moment we arrived, we were greeted by a valet and our luggage was delivered right to our room. After we checked in, we were handed a cold glass of champagne and given a brief tour of the hotel. From the hotel lobby, you look straight into the main restaurant, which has an open concept, and out over the pools and the gulf of Mexico! Before we even made it to our room, I knew I was going to love this place. The Edgewater Beach Hotel is the only all-suite hotel in Naples, Florida. Our room was stunning! We had a wrap around patio, with a view of the pools and the beach. Each room has a kitchen, dining area, living room, and full bedroom set up making this the ideal spot for families and week long stays. After settling in we decided to check out the pools…yes there are two! Between the pools, there is a beach bar where you can order food and drinks for the pool area or the beach. At the end of the pool just before the sand begins there is a fire pit, both my husband and I looked at each other knowing we would venture down here later in the day. The Edgewater Beach Hotel has an expansive beach area, with options for lounge chairs, day beds, and even a full VIP set up. One of our favorite parts of the hotel was how private it was, with only 125 rooms it really limits how many guests they have each day. We enjoyed our first dinner at Coast, the main restaurant at the Edgewater Beach Hotel. The cocktails were unique and the staff was well versed on the wine list. I had the scallops and my husband had the grouper, the presentation was beautiful. The Chef came out to check on us and introduce himself. I was comforted knowing that the staff and the chef were very aware of my food allergies, and adjusted each of my dishes accordingly. During dinner, we watched the sunset over the pools, feeling the vacation vibes begin to set in. The next morning the hotel had arranged bicycles for us to ride into Old Naples, were we enjoyed local coffee. The bike ride through Old Naples was beautiful, and offered us a fresh and new perspective to our town. After the ride, we picked up our beach brunch picnic basket and went down to the beach. To our surprise and delight the Edgewater Beach Hotel set up a VIP beach set up for us. (When staying at the Edgewater the VIP beach set up is a must!) We leisurely enjoyed our brunch while watching dolphins play.This was one of my favorite parts of the entire weekend. After breakfast we lounged beachside for hours, truly understanding the meaning of a wellness weekend. We were able to unplug, unwind, and relax! (much needed for two ambitious professionals) We attempted to paddle board after lunch, however due to the waves we did not have much luck … next time! After the most relaxing day beachside, we freshened up for dinner at Coast. We tasted a variety of appetizers, entrees and desserts each better than the last. The food (all gluten free and diary free for me) was surprisingly amazing! I am often disappointed when dining out because the gluten free and diary free options are so limited and often tasteless … not here. The scallops were my favorite. Saturday we participated in the Paradise Wellness Weekend, at the Edgewater Beach Hotel. We started our morning with beach yoga, two of my favorite things, and then enjoyed a mind and body workshop with the Spread Happy duo followed by a cooking demo from the Chef. We learned how simple the green smoothie and cauliflower quinoa cakes are to make - blog post with the full recipe coming soon! I honestly did not know much about the Edgewater Beach Hotel prior to my stay, but I can say I was blown away. This high end luxury hotel is a wellness destination and one of my favorite spots to date. I loved how private the hotel was, how many activities and fitness options they offered, but my favorite was the wellness. As a health and wellness professional, I provide wellness to my clients daily, but sometimes forget to put myself at the top of my to-do list. This weekend allowed me time to restore and rejuvenate myself. Another one of my favorite parts about the hotel was their Be Well menu in their Coast restaurant. Edgewater Beach Hotel became a Blue Zones approved partner in 2018 and since then added several Be Well (and Blue Zone approved) items to their menu. 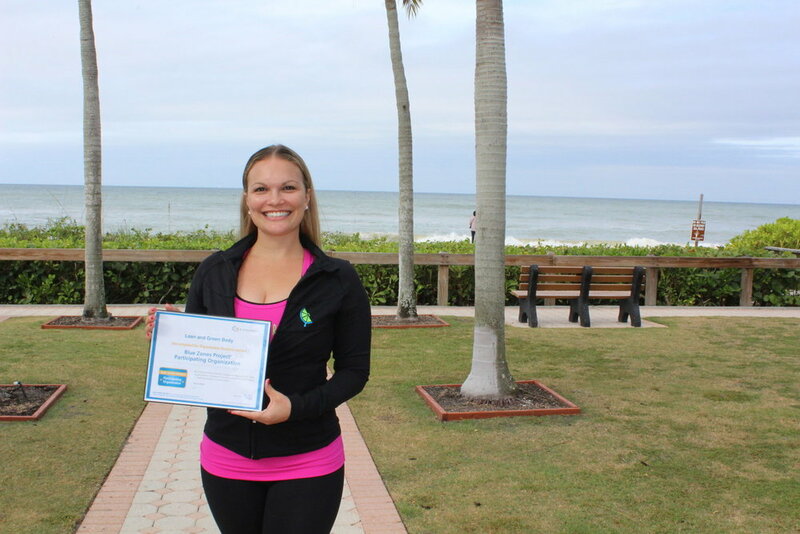 Edgewater Beach Hotel has become one of the top wellness resorts in Southwest Florida with the infusion of the Be Well menu, a high end gym, aromatherapy towelettes, and weekly yoga classes. Staying at the hotel and don’t want to miss your workouts - no problem, the Edgewater can have a personal trainer or yoga instructor available to you during your stay. 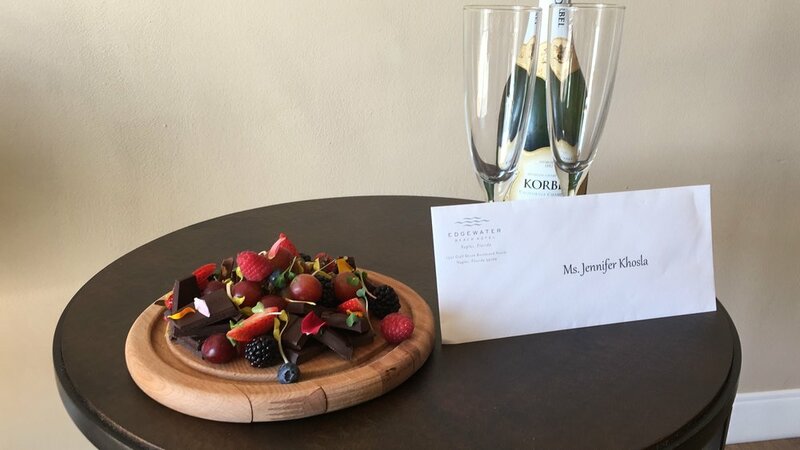 Everyone at the Edgewater Beach Hotel was exceptional and went above and beyond to ensure our stay was everything we wanted. There were a few team members who stood out that we would like to thank for making our trip so wonderful. Louise, Wendy and Herry were our favorite servers and made every meal special. Special thank you to Laura, McKenzie, Dan and Alice. This is a sponsored post, but all thoughts and opinions are my own. Wow. What an incredible year it has been! Honestly, 2018 has been the biggest year professionally of my life. When I look back at this past year, I am amazed by all of my accomplishments and everything I have built for Lean and Green Body®. I am happy to say that this is only the beginning of Lean and Green Body® … we are just getting started! Since August 2018, I have had the privilege of being featured in the following publications: Naples Daily News (online video and front page of the paper), Gulfshore Life Magazine, Naples Herald, and Naples Illustrated (coming January 2019). July - Made the decision to close 5th Ave Studio … only to go BIGGER!! September - I won Top 40 under 40 for all of Southwest Florida!! October - Became a Certified Fitness Nutritionist through ISSA … love continuing my education and staying current on new wellness ideas for my clients. December - I was asked to sit on the board of the Red Cross. December - MALK Organics asked me to become a national partner, and work with them as a nutritionist. I am so excited for this partnership, because together we will be able to educate the public on a national level. 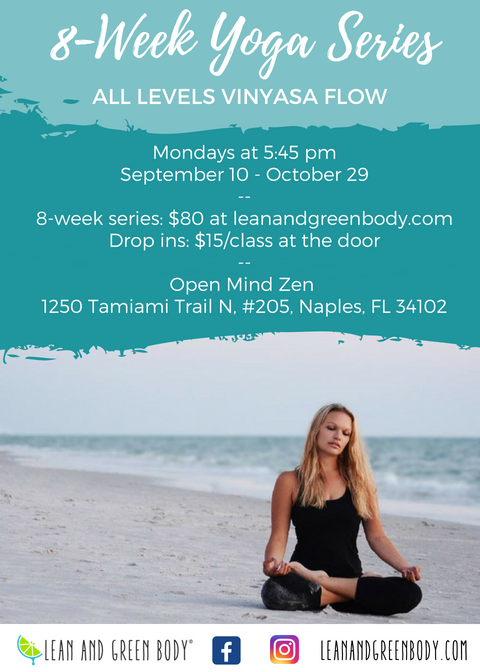 December - Mindful Movement Studio powered by Lean and Green Body® … pre-sale started December 17 and beta launch is January 1! This year has been incredible! 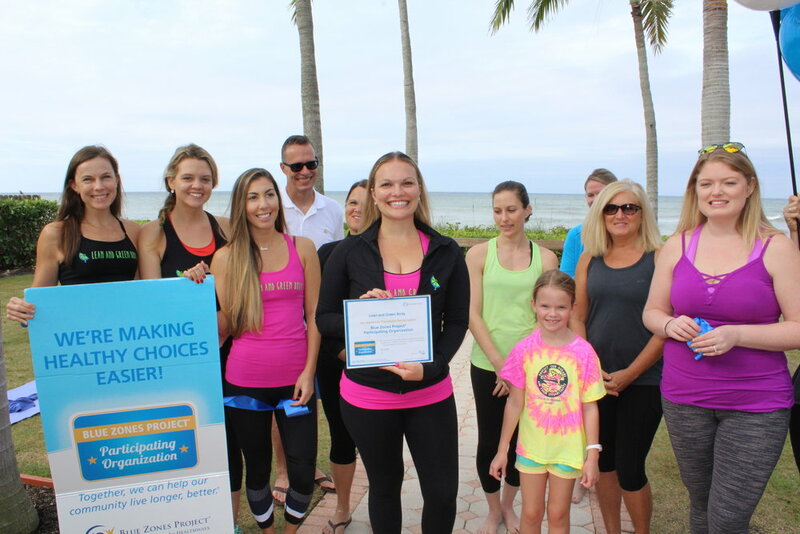 Through Lean and Green Body®, I have been able to host over 20+ events for our Southwest Florida community. Thank you to all of you, who have supported me through this momentous year of growth. In 2019 Lean and Green Body® will officially be a national brand!! I am so excited and ready for this expansion, and to educate the greater community on the importance of wellness and a healthy lifestyle. It’s official!! Lean and Green Body® is a Blue Zones Project® partner! The ribbon cutting was on Saturday, November 3rd at 8th Ave South in Naples. We were honored to have the official Blue Zone’s team there to celebrate our new partnership. Lean and Green Body® is excited to be a partner and support the mission of the Blue Zones Project®. 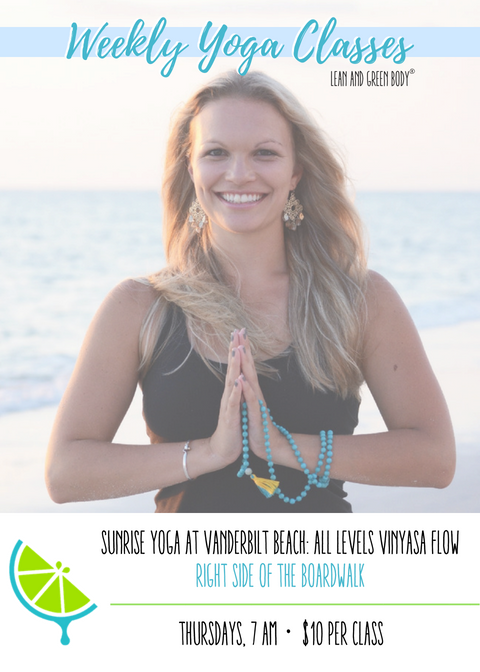 The ribbon cutting was followed by a 60 minute vinyasa yoga class over looking the beach … the sound of the waves soothed our souls during savasana. Delicious Raw and Epiphany Bakery both showed their support with post yoga treats! So what is the Blue Zones Project®??? According to healthways.com “A Blue Zones Community® is an area in which citizens, schools, employers, restaurants, grocery stores, and community leaders have come together to optimize residents’ longevity and well-being. Blue Zones Project® by Healthways takes a systematic, environmental approach to identifying and creating policies and programs that support community transformation. “. Blue Zones is working to create healthier communities, helping us to live longer better lives, one partnership at a time. Down Shift: reverse disease by finding a stress relieving strategy that works for you. Purpose: wake up with purpose each day to add up to 7 years to your life. Plant Slant: put less meat & more plants on your plate. Wine @ Five: enjoy a glass of wine with good friend each day. Family First: invest time with your family & add up to 6 years to your life. 80% Rule: eat mindfully & stop when 80% full. Move Naturally: find ways to move more! You’ll burn calories without having to think about it. Right Tribe: surround yourself with people who support positive behaviors. Belong: belong to a faith-based community & attend services 4 times er month to add 4-14 years to our lifespan. Weekly yoga classes begin at our 5th Ave S studio location Monday May 28! We will be offering 3 weekly yoga classes through June, and already have plans to expand to 12+ yoga classes per week. All classes will be 60 minutes long, and will cost $15 per class. Big Announcement...Coming Soon: weekly yoga classes at our 5th Ave S studio location! We are thrilled to announce that we will be starting weekly yoga classes at our 5th Ave S studio location! We will begin with the following schedule starting Monday May 28 with plans to expand. All classes will be 60 minutes long.